From the ProfWeb blog (Profweb : Lancement du concours des prix du ministre : une invitation aux pédagogues de l’enseignement supérieur), we leard that the Guebec government is launching a prize for innovative practices in Higher Ed. Works have to be in French and the deadline is in November for colleges/Cegeps and january for Universities. In addition to the news of the Gates Foundation giving 9 million dollars for “inovative education practices (see: Wired Campus blog post on June 19th), Google has joined the fray for Massively Open Online Courses (see this other post on Wired Campus, a tech blog of the Chronicle of higher education). Of particular interest is this page about the design process of an online course from Google. “Pssst… you may want to check out Google’s Free classes called Power Searcher…” said my colleague’s email. Although I know, use and teach many of Google’s advanced features, I could not resist to test-drive their online learning platform and initiative. I also like the pace, or how all learning objects are integrated in the flow of the initiative. Each lesson, a 3 to 8 minute video, is followed by activities, usually multiple-choice of short answer questions. Learners are also called upon to open new tabs and perform steps outside of the environment. Also, videos start with a slide, showed for 3 or 5 seconds, that cover the learning objectives/outcomes of the lesson. 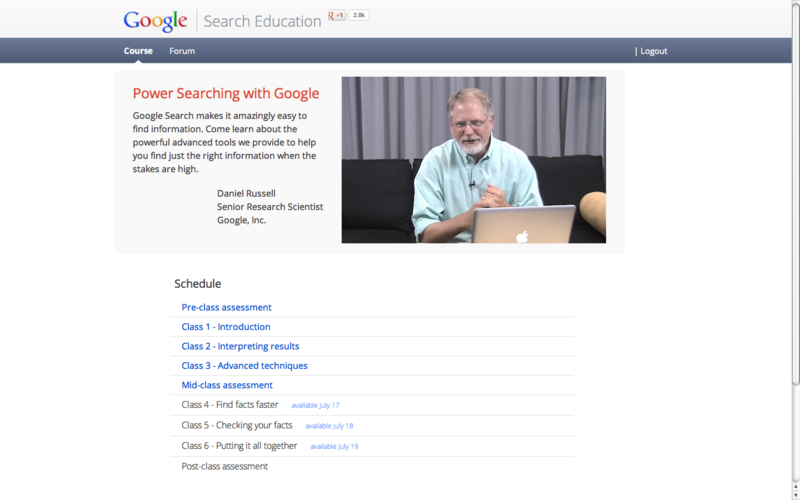 Daniel Russell, Senior Research Scientist at Google, provides for en engaging series of videos. Usually, the focus is on slides from a Presentation with his “talking head” in a smaller window – this is the same setup I use for my own training videos. Now, the only criticism I can provide is the subtext of the presentation. Now, this is a corporate learning initiative, so I was expecting to get fed a lot of Google products (this actually – surprisingly – is quite pleasantly accomplished). But what slowly got on my nerves is that Daniel Russell assumes gingerly that everything you would ever wish to find is on the free web, indexed by Google. Honestly, this criticism is very personal and I want to congratulate and thank Daniel Russell and the folks at Google for this engaging, interesting and relevant tour of their “Data garden” – Merci ! The Guardian’s Higher Ed blog has an interesting piece on “digital literacy” in the university classroom. Beyond skills, the post covers specific ideas from engaged faculty. Digital literacy as an important part of transliteracy: Transliteracy is the ability to read, write and interact across a range of platforms, tools and media from signing and orality through handwriting, print, TV, radio and film, to digital social networks. It is the literacy of convergence, unifying literacies past and present across different platforms, media and cultures. This means it encompasses all kinds of communications from scratching pictures in the sand to editing photos in Instagram, or from inscribing tablets to text-messaging. When promoting digital literacy on its own, we can alienate people who are already very literate in other areas, and that’s why I prefer to take an holistic approach and be as inclusive as possible. I could not resist the temptation to enroll despite the fact that I have a pretty full plate for the next few weeks. 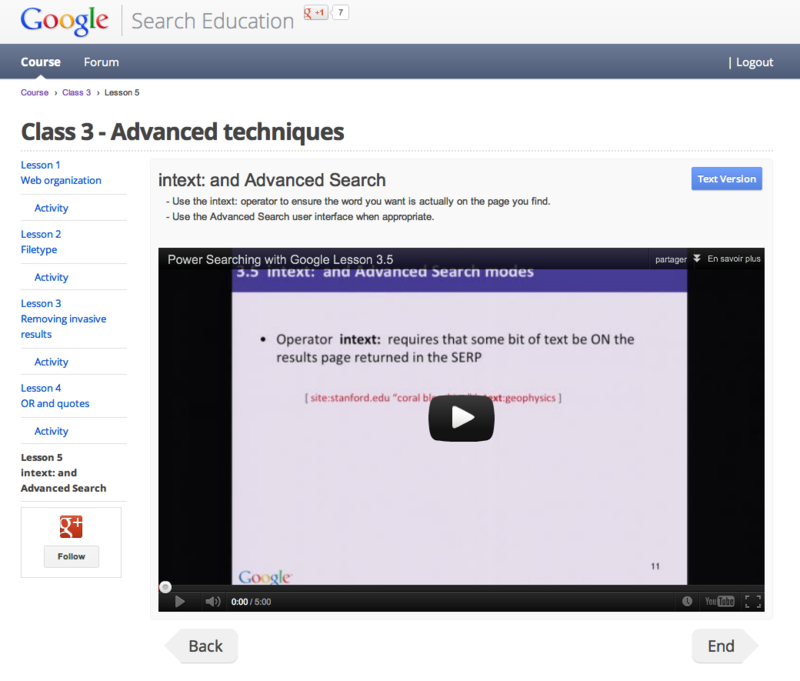 By the way, you can read more about Massively Open Online Course (or MOOCs) on this recent post on OutFind.ca. We had a very interesting meeting today with Concordia’s Center for Teaching & Learning. The goal of the presentation was to explore partnership ideas, but we also discussed how the Library could contribute to a blended learning initiative at our institution. Firstly, the main point brought was the idea of a “learning object” – a concept that we did not quite hammer out. I would offer this personal definition : a learning object is a type of document that presents information or knowledge to enable a learner to achieve a specific outcome. A learning object may (recursively) contain one or many other learning objects. Templates are useful tools to present this information or knowledge in a structured way. A learning object repository is a collection of curated learning objects, with associated metadata. Secound, I would like to point out that there are many agents in this environment : the learners (obviously), the instructor or their assistant, the content owners and the system administrators. Each one of them has a role to play in the conception, organisation and provision of learning objects to learners. Of course, the goal would be to identify all the learning objects and all the agents that are relevant in this environment. It may be easier to start with all the distinct templates of learning objects (as there may be too many learning objects). I devised this model during the course of my graduate degree in law (I’ve explained it on this blog post) and I’ve presented it at an IFLA Pre-Conference. Now, this model tries to map out the Web 2.0 environment – I will make the claim that “blended learning” is functionally equivalent to Web 2.0 on a conceptual level (sorry for not prouving this point thoroughly – more on that later perhaps). 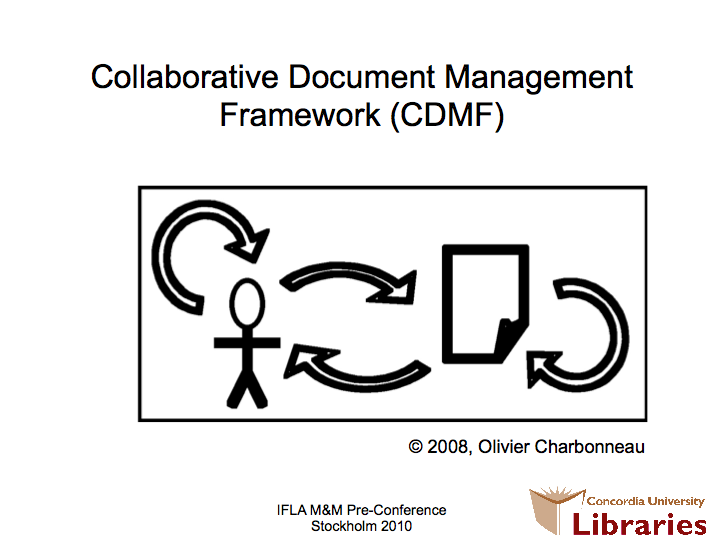 It is defined as 2 elements, documents and agents, interacting through 4 generic relationships: linking (document-document); conversations or intermediations (agent-agent); using (document-agent); and contributing (agent-document). This is meaningful in a discussion of a library’s role in a blended learning environment as is helps define exactly where it may be useful. Specifically, I find that the priority is to identify areas where librarians may be contributing content – creating learning objects, followed closely to linking these learning objects to form paths through the knowledge base. Finally, librarians may play a role in the conversations that may happen in the environment between the various agents (focussing, as a priority, with the conversations that happen with the gatekeepers of knowledge: instructors and their assistants). Special thanks to Pamela Carson and Vince Graziano, two colleagues from Concordia University Libraries, for our very interesting conversation that was instrumental in organizing this post.